Kids will be amazed at the result of the shiny coins experiment. Before you start this kids science experiment, let the kids find some dirty copper coins laying around the house. 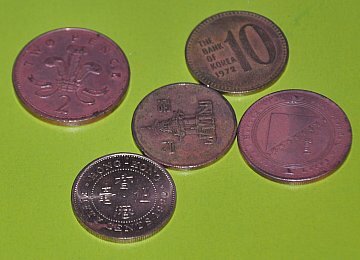 Copper coins work best for this activity. Pour lemon juice in a glass less than 1/2 full. 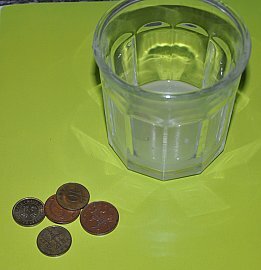 Place dirty copper coins in juice and let sit overnight. Take coins out the next morning and dry with a paper towel. Can you tell the difference from yesterday? Get all of our Food Science Section in one ebook, free of ads and easier to use in cooking activities. These 20 food science experiments are to teach kids about science in the kitchen. We have two sections included in this ebook one for younger chefs and one for older chefs. The acid from the lemon juice eats away the dirt and cleans the coins. You can use Cola instead of lemon juice for this experiment also.